Synopsis: David Piper has always been an outsider. His parents think he’s gay. The school bully thinks he’s a freak. Only his two best friends know the real truth: David wants to be a girl. I received a free advanced reader’s copy from Netgalley in exchange for an honest review. 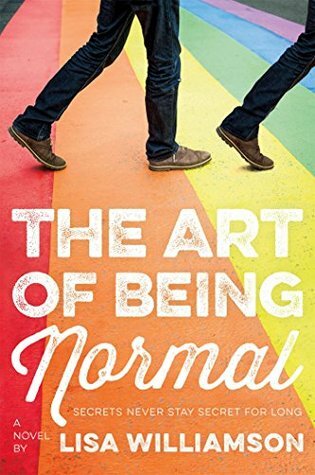 The Art of Being Normal was an incredible read! I loved the main characters, David and Leo. They were vastly different–David, bubbly and friendly, and Leo, mysterious and brooding–but I love how their stories intertwined to form this beautiful consonance. Their friendship was absolutely dynamic! This book has the perfect combination of humor and seriousness; seriously, my emotions were all over the place! Even though it was a bit predictable, I was still excited, or angry, or sad when the expected happens. While the parents, siblings, and friends were important, and the novel explored topics like bullying, I wish that the minor characters had more scenes and bigger roles… the friends and siblings especially seemed more like plot devices to move the story along than actual people with real personalities. Overall, this is a great story told from the point-of-view of a transgender character about being transgender. It’s an important read and an extremely emotional journey that I would recommend to any and everyone!